I love my iPod Touch and on more than one occasion, it’s been a fantastic sanity-saver by occupying one or more of the kids. Now, I’m not advocating for “digital distractions” (well, not on a regular basis anyway), but many of the apps offer genuine educational value. In an upcoming post, I’ll review the kid-friendly podcasts that I make sure to have loaded on my iPod for road trips and unexpected shopping wait times. Note: Prices on Apple’s non-free apps tend to change frequently. The cost I included is as of the writing of this post. This simple but addictive game involves selected a balloon, inflating it (with a slide on the Touch or blowing on the microphone on the iPhone), shaking it to twist it into an animal shape (you’ll really have to trust your kid not to let it go flying), then using various sliding gestures to make it do hilarious things. ALL of the kids continue to play this on a regular basis. What can I say? It’s a cool, free checkers game. ‘Nuff said! This is a digital version of the paper-and-pencil dots game I grew up playing on restaurant placemats. This is probably better for older kids, though adults (like me) may find it nostalgic. This an addictive game that is suitable for kids and adults. My oldest (aged 6 years) started playing with the free version and got pretty good at the puzzles up to level 3 or so. That’s when I picked it up, conquered the remaining levels in the free version, and promptly downloaded the free version. This finger-painting app has an almost hypnotic quality to it. While not specifically designed for kids, I regularly find them playing with this, tweaking the settings to produce “artwork” similar to digital spin art. Another game that doesn’t need much explanation. Remember Connect Four? This is that game…just on a touchscreen. This simple game shows two screens of cartoon animals that, when touched, tell you the sound that animal makes. Simple, but my younger ones regularly play this one. A little critter helps the kids draw lowercase and uppercase letters as well as numbers. I was surprised the older kids liked this since they do more challenging writing assignments as part of their homeschooling. I was equally surprised that my 2-year-old could actually play the game. The free version is more limited, but is a great way to see if your kids like the game play. This is a word-jumble game for adults and is addictive for word-game nuts (like me and my wife)! However, I include it here because I’ve set it to 5-letter puzzles with “infinity” time limit and my oldest has fun with it, even if she can’t solve many of the puzzles. What do you get when you mix classical art with a basic puzzle? This fun game that exposes the kids to several iconic pieces of art. The settings allow you to set how many slices are used. One of the kids’ absolute favorites. When the barn shakes, you touch it, it slides open to reveal a farm animal and the sound it makes. Repeat. Has a really cute ending, too! There is a free version, but really, just download the full version! If you really like this app, I suggest getting the sequel Peekaboo Wild, which is currently $1.99. Like digital flashcards, this game asks “Where is the [animal]?” and provides decent feedback when the child touches a correct or incorrect choice from the four pictures shown. While the cartoon animals aren’t very realistic, it’s still a fun game. This cute app includes four music-oriented games. The kids like this a bit, though it doesn’t hold their attention for too terribly long. Select a tune from the catalog, then either tap it out (with adorable icons bouncing out) or simply hit the play button. The free version includes a very limited catalog, but will give you a sense of the app. The full version includes a very extensive library of songs. Another “duh” app, though this one can be enjoyed by younger kids. The kids took awhile to warm up to this one, but now they all love it. Offering six full songs (Wheels on the Bus, Working on the Railroad, Head, Shoulders Knees & Toes, Row Your Boat, BINGO, and Word by Word), there are no flashy visuals, just a simple acoustic recording that the kids sing along with. Think of Tetris meets Jenga. As the squishy blocks fall, you place, twist, and rearrange them so the stack doesn’t topple! They’ve since come out with a couple of new versions, but I’m perfectly happy with the original. While this is most expensive app in this list, I’ve certainly gotten my money’s worth. Each verse in this song favorite has an interactive animated cartoon that makes singing along that much more fun! What other apps have you found that are a must-have for kids? Let me know in the comments! If you’re a Facebook user, you’re undoubtedly concerned about the recent (and seemingly ongoing) changes in the privacy controls the site offers. And if you’re not among the whopping 35% of users who bothered to adjust your settings, you should be. Social networking sites are increasingly providing opportunities for security incidents. People have really gotten comfortable not only sharing more information and different kinds, but more openly and with more people. That social norm is just something that has evolved over time. Whether or not you agree with Zuckerberg’s assertion, take a moment to check your privacy settings. The following tutorial shows the settings I made to ensure I controlled the information I could and reduced the information I can no longer control. NOTE: I have invented a profile for the Lord of the Rings character Gollum to use as a humorous example for this tutorial. First things first. You are the first and best source of security; privacy starts with your own choices about who to friend. Just because someone initiates a friend request, doesn’t mean you have to accept it (that’s why Facebook offers an “Ignore” button!). Before you click “Accept,” think about why you’re friending that person. And be confident that it is, indeed, them. I was recently contacted by someone I barely knew in high school. When I sent a message to him explaining my security concerns with Facebook and asking how we knew each other, he promptly responded with details that only he (or a determined and creative impersonator) would know. If you’ve already gone “friend crazy,” consider un-friending people who you don’t really intend to keep up with. It’s okay, Facebook won’t even tell the person you’ve unfriended! If you are someone who friends people from different circles (e.g., personal and professional), you should consider setting up groups in Facebook, too. This will help you, for example, share personal information with personal contacts and not your work colleagues. Now let’s dig in to the privacy settings. Your Profile Information settings control who can see the information you add to your basic Facebook profile. Start by going to Settings, Privacy Settings in the upper right of Facebook. Next, click on Profile Information. Depending on the choices you made during Facebook’s last round of changes, your profile information may have defaulted to show the world your account. To see what non-friends see when they search for you on Facebook, click “Preview My Profile…“. Check this periodically as you make various changes to see the impact of your changes. As for your Profile Information, I would recommend at the very least changing each option to “Only Friends.” This at least limits who can view your profile information to those you’ve already accepted into your network. Alternatively, you could choose “Custom” and choose only certain groups of friends. Your Contact Information settings control who can contact you (and how) via your Facebook profile page. Click on “Privacy Settings,” then on Contact Information. Like the previous settings, change most of these to, at least, Only Friends. The exceptions I made here are for “Everyone” to see my website address, and the “Add Me as a Friend” and “Send me a message” links. The Applications setting controls what your friends can share about you via applications they use. Back at Privacy Settings, click on Applications and Websites. In this section, you only need to adjust What your friends can share about you. Click Edit Settings. As you can see, I am fairly restrictive about what my friends can share about me through applications they use on Facebook. Use your own judgment as to what information you want your friends to be able to share about you. Your Search settings control what, if anything, search engines and Facebook users can see in your profile. Back at Privacy Settings, click Search. Again, notice how restrictive I make my settings. I only allow Friends to find me on Facebook. Ultimately, though, I can’t prevent someone from viewing my profile via one of my friends profile pages. I also unselect the Public Search Results checkbox. Click the see preview link to see what search engines will gather about your profile if you leave the box checked. The following image shows what a search engine would catalog about Gollum. Notice the list of friends? This information is shared by default for every user and cannot be changed. This is the main reason I chose not to activate the Public Search Results setting. Think you’re done? Not yet! Head to your profile page to fine-tune what people can see there. On the left-hand margin, locate the Information box and click the pencil/edit icon. This will give you a list of items you can choose to show on your profile page. Note that I’ve omitted items like birthday, hometown, and political and religious views. That way, users who view my profile from my friends’ pages will only see the information I want them to see. Scroll down and locate the Friends box. Click the edit link and uncheck the option to “Show Friend List to everyone.” This will ensure that anyone who views your profile via your friends’ profile pages will not see your friends list. The following is what someone viewing Gollum’s profile page would see if they weren’t a friend. One way to see this for yourself is to create a fake alternate Facebook account and not friend yourself and find your profile page (unfortunately, Facebook actually frowns on creating multiple accounts). In the image above, notice how the profile page shows the “Pages” Gollum is following. For this reason, I recommend you be selective about which bands/movies/products/etc. you “fan.” More and more, prospective employers are rejecting applicants based on their profiles on sites such as Facebook. What does your profile say about you? Now that you’ve adjusted your privacy settings, it’s time to check your account settings, primarily to ensure your personal information doesn’t appear in Facebook ads. The only settings you need to worry about here are on the Facebook Ads tab. Again, I took the conservative path on this one, setting both options to “No one.” This means that none of my personal information will show up on ads anywhere on Facebook. Similar to my precaution about who you friend, I encourage you to limit which applications you authorize to access your account. Second only to the social engineering risks inherent in accepting friend requests, Facebook applications open you up to unnecessary security vulnerabilities. I mean, do you really want to annoy everyone with your Farmville and Mafia Wars activity? When you land on the applications page, change the drop-down selection to “Authorized.” This will show you all of the applications you have granted access to your account. Now is a great time for you to easily axe all of the applications you don’t actually use. Simply click the X to delete that application. For those applications that are left, you can specify the particular security settings by clicking Edit Settings. I realize this is an extensive list of security settings and there’s no guarantee that it won’t change next month (if it does, I’ll try and post an update). But if you’re serious about maintaining control of your personal information, take the few minutes it takes to adjust your settings. Then you can go back to posting updates, photos, and other information knowing exactly who is able to see your activity. There has been so much buzz over the past week month year about Apple’s new tablet PC, dubbed the iPad, so I’m glad last week’s press release finally unveiled the thing before I got sick of all the rumors. Yet, now that the event is over, I find myself very disappointed. There are already many rants and raves about this device (Hightechdad just posted a good one as did Mashable). Perhaps my favorite so far is on engadget, which uses one poignant word to sum up the new device: unimaginative. Here are just a few reasons why I don’t like the new device (I’m going to refrain – mostly – from commenting on the awful name, as many are already doing this more justice than I ever could). Basically, all of the same complaints I have about my iPod Touch, which is now, essentially, the older brother to this Baby Huey. While they did add a microphone, why did Apple cripple the capabilities of this device over its more-popular cousin, the iPhone? I guess the augmented reality possibilities slipped by the engineers. If you’ve ever used an iPhone/iPod app, you know that they are designed to fit the limited screen real estate offered by the small screen. Now Jobs would like me to believe that using those same apps on a much larger screen is going to be seamless? Where’s the OLED screen that would offer super-low-power? Or even more innovative: a display that could toggle between black & white e-ink for easy reading (and low power consumption) like the Kindle, then to full-color for everything else? While LCD may still be mainstream, I expected something different from Apple. My main complaint is – and maybe this is for all tablets – how could I work on this thing? As I outlined in a previous post, I think there continues to be a battle of portability versus productivity. Like it or not, the keyboard is still the primary input method for creating new works (other than art) on the computer. A tablet PC, like my iPod Touch, will always suffer in this area. You simply cannot type as fast on a touchscreen (or laser keyboard, or roll-up keyboard – remember those?) as you can on a standard “real key” keyboard. And the keyboard dock accessory (shown here) will be a pain to lug around (and it’s portrait orientation of the iPad is a bit strange, too). I’m convinced all the hype is just a symptom of “Apple-fanboyism” since so many other worthy gadgets are coming to market without nearly as much fanfare. Even Mashable editors think that the hype over the Apple tablet is greater than anything it can deliver. Take the awesome new netbook/notebook form factor debuted by Lenovo at CES 2010. The “IdeaPad U1” isn’t scheduled to hit the consumer market until this Summer, but when it does, I’ll be closely examining the specs (and price!) to see if I’m ready to upgrade from my Asus EeePC 1000HE (which I still love!). The U1 combines the innovation and portability of a tablet with the productivity of a notebook by allowing the screen to pop out and be used independently as a tablet PC. Another Lenovo creation is the IdeaPad S10-3t (available now for $550) which offers a swiveling LCD screen that can fold flat against the keyboard and serve as a touchscreen tablet PC. I may consider this model once the price comes down a bit. Do I have it all wrong? When I originally drafted this post, I concluded that the iPad wasn’t really all that big a deal and that I just couldn’t see myself wanting one. But maybe this isn’t designed for me. I have a smartphone for talking, texting, and mobile surfing/”app”ing, a Kindle for reading ebooks, a netbook for everyday tasks, and a desktop for more heavy computing. Earlier, I complained that I wouldn’t be able to work on this device. Maybe I’m not supposed to work on it. Maybe it’s supposed to be more of a media consumption device than a media creation device. If that’s the case, than I’ll wait for the U1 or a similar machine that will allow me to do more than just listen to music, watch movies, and surf the web. For now, I’m all set with the devices I have. I’m convinced it’s a symptom of “Apple-fanboyism” since so many other worthy gadgets are coming to market without nearly as much fanfare. 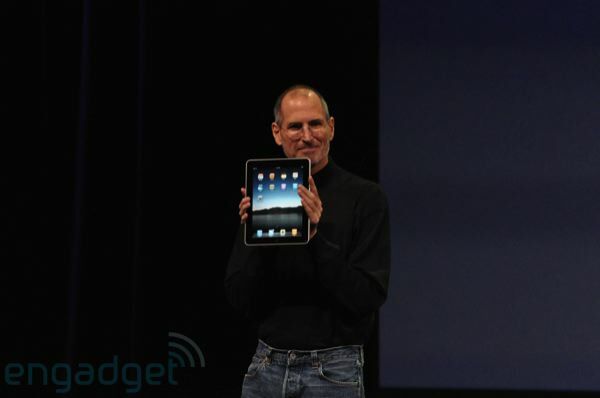 Even Mashable editors think that the hype over the Apple tablet is greater than anything it can deliver.